Seasoned CMO Theresa Marcroft serves CEOs as their “interim VP Marketing”. If you have no marketing leadership in place now and need an interim executive, Theresa will develop your go-to-market strategy, craft your positioning and competitive messaging, upgrade your web site, set up demand gen programs, and jump-start your PR. If you need hands-on marketing today, you’ve found a great solution. Theresa leverages 25+ years of marketing success to coach your marketing leader in effective, strategic B2B marketing. Learn how to develop the right go-to-market strategy, distill effective messaging and build a brand. If you have a marketing director in place and want to augment that raw talent with practical, experience-based coaching, let's talk! Read more. Together, we’ll grow revenue and win market share by applying classic & contemporary marketing techniques to B2B companies. 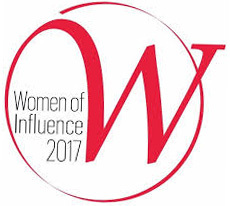 Named among Silicon Valley's Women of Influence 2017. Celebrating MarketSavvy's 15 years of serving technology company CEOs as their interim CMO. Based on early training at Regis McKenna Inc., Theresa applies Geoffrey Moore's "Crossing the Chasm" principles and real-world revenue growth expertise to client work every day. The Technology Adoption Life Cycle concepts are the proven foundation of highly effective B2B marketing strategy. Now, you can capitalize on deep expertise and decades of experience without a long-term commitment. Theresa will position your company for growth and deliver results. "Theresa launched our new security product line and generated 700+ leads this year" ... "garnered amazing press coverage for us" ... "grew revenues by 45%" ... "developed our channel partner program from scratch" ... "developed all-new messaging for us so we now have a simpler, more powerful story" ... "positioned us in a new market" ... "secured key analyst support for us" ... "grew market share by 35% and doubled revenue" ... "found great resellers in Asia and Europe" ... "coached international channel partners in their marketing plans" ... "created an award-winning corporate video for us" ... "secured speaking engagements at key conferences" ... "had significant impact on our bottom line." See what Theresa has done for more than a dozen clients. Theresa brings three decades of experience as a VP marketing to bear when coaching your marketing leader. We start with corporate objectives (business goals) and meet them through smart marketing strategy. I'll teach your team to assess the competitive landscape, distill your unique value, articulate clear messaging, position your products, define your target customer, and generate demand to grow market share. Not only will your team be more productive and effective, your marketing leader will learn how work more effectively with your C-level executives. Over the last two decades as a VP marketing, Theresa has assembled a virtual team of top-notch professionals who are among the very best in the business. At any time, she can draw on graphic designers, writers, printers, videographers, web developers, photographers, PR pro’s, and others who can pitch in to serve her clients. MarketSavvy clients can tap into world class expertise and benefit from access to these proven specialists only when they’re needed, without the overhead of keeping them on staff.